What would happen if you wrote down the best thing that happened each day on a slip of paper and put it in a jar? Maybe you do this for a month, or a year, maybe longer. Now imagine being able to reach into that jar and smile at a different memory with each slip of paper, smiling as you enjoy it the second time around. 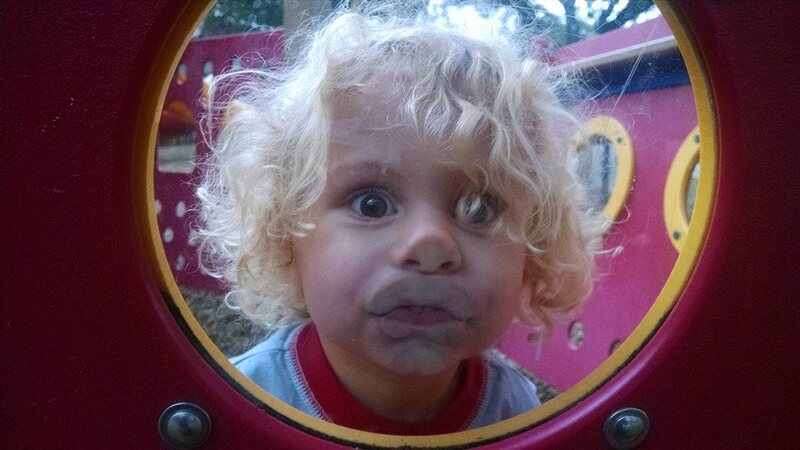 Would your life improve if you could see the humor in difficult situations? If you could, while some fool keeps yelling at you, envision that same person wearing a diaper and sucking on a pacifier? Or maybe you just choose to escape life’s difficulties by watching slapstick comedy, or going to an amusement park. None of this means you are irresponsible; it’s a simple matter of seizing joy. What is the point of life if you don’t have any fun? Our schedules get so busy, it’s easy to put that off till we forget how to laugh. Prior to becoming a mental health counselor, I made my living doing family-oriented singing telegrams, creating personalized skits in the persona of several ridiculous characters. And I loved it! Making people laugh is the kind of thing that–well, it was impossible to avoid embracing some of that joy for myself. That helped me through some otherwise difficult times. Children have a lot to teach us in this area. When they are in pain, they show it, and they don’t carry that weight any longer than necessary. They run, play, laugh–and bring joy to others in the process. I hope you, each of you, finds some of that same joy every day. Did you knit that bicycle? When my networking group met at a Granville coffee house this morning, we found ourselves right across the street from a “yarn bombing” site. For those unfamiliar with the concept of yarn bombing, a group of unknown people make a stealth “attack” sometime before sunrise, and decorate trees, railings, benches–you name it–with their knitting. There is even a world yarn bombing day, and apparently this is it. At least according to the notation they included on some of their work. It puts smiles on a lot of faces. I still knit a little; I did a lot of it in my younger days, even worked in a yarn shop and taught classes. We didn’t yarn bomb in those days, mostly followed patterns and made afghans and outfits for ourselves and our families. 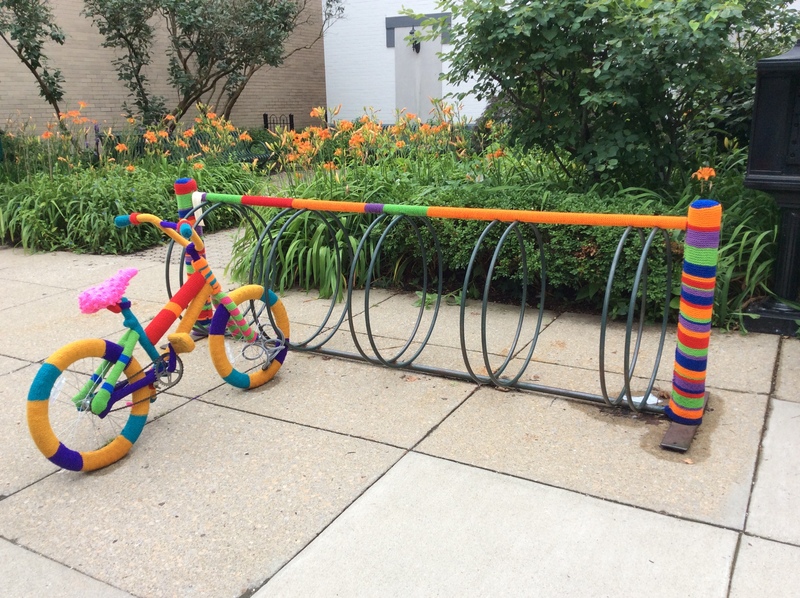 I do like the whimsy of the yarn bombing. Mobility equipment is a favorite target of mine. If you are going to be stuck with a walker, or crutches, or a cane, why not have some fun with it? A wheelchair would look great with some creative knitting on the armrests or across the back. One friend of mine covered her medical boot with black knitted piece featuring a pink flamingo on the front and the word “Ouch” across the back. Me? I just use up scrap yarn to decorate canes and walkers. Got my start with my own crutches when I had foot surgery. A young girl told me I should call it “crutch cozies.” Smart kid! If it makes people smile or laugh, and not in a hurtful way…well, I’m all for spreading joy. It’s only one way out of many. Personally, I kind of hope the Granville yarn bombers manage to stay anonymous; they are spreading kindness in their own unique way. Have you ever been walking down the street on a day when it felt like your world would end, and a total stranger said “Smile; it can’t be that bad.” How would they know? Yeah, it can be that bad. And you have a perfect right to your feelings. While sadness is no excuse to be rude to others, I personally don’t see a need to appear totally cheerful 100 percent of the time. That is simply not realistic. Maybe you just had an ugly spat with someone dear to you. Or you learned your best friend has Parkinson’s. Maybe it’s just a pile of smaller things that have taken their toll. Whatever you feel is genuine. This stranger may feel he or she is doing a genuine kindness to suggest you smile. Or they may just be uncomfortable with your sadness. But how they feel is their problem, not yours. Just as how you feel is not their issue (unless you choose to share it). All your feelings matter. And they all need to be acknowledged, even the negative ones. If we don’t find some way to honor our negative feelings, we are too likely to keep them inside. Which leads to flattening all the emotions, good and bad, and can even lead to a general feeling of melancholy. Infants and young children’s emotions have a tendency to “turn on a dime.” They may be laughing, then suddenly in tears, or vice versa. But there is no question about what they are feeling; it’s right out there. Then they get a little older, and they sometimes show frustration by acting out, and the adults in their world have the dubious privilege of interpreting this behavior. If you are reading this, you have presumably reached adulthood. Which is certainly no guarantee of having it all figured out. All those years you were a child and figured that once you were 18 or 21 or whatever, you would always know what to do. But one thing is simple, though not always easy: Honor your feelings and those of others. Feel free to talk about them with someone you trust. When you can get the negative feelings out of the way–sadness, frustration, anger–in constructive ways, the happiness will be so much greater. Try it; you might free yourself to feel as playful as the little guy in the picture.